Zoning is set in place by the City of Saskatoon as soon it becomes part of their land inventory. When a new neighbourhood is being proposed, the zoning for it will be laid out in a community plan. But what if you have your eye on a property that requires a different zoning for your intended use? Then we enter the wild world of rezoning. There are two types of spot rezoning, basically a straight rezone to another existing type of zoning or zoning by agreement. The process of rezoning either way follows a similar path but the outcome can be significantly different. I hesitate to use the word “regular” on a rezone. Depending on what you are rezoning or where it is, the process can be anything but regular. For the sake of this conversation, we’ll assume you’re rezoning to something that doesn’t have any pushback from the community. The first step is to set up an appointment with the City of Saskatoon to determine if your new vision aligns with something they can agree to. Once you reach agreement, there is a period of advertising and opportunity to allow the community to respond to the request. The community response may or may not involve a public meeting where further information regarding the impact of a rezone can be discussed. I have a good example we came across this week. Saskatoon’s golden retail mile, 8th Street, is for the most part commercially zoned. In this particular case, the street backs residential properties to the north and south so there is extra sensitivity to rezoning by the residents in the area. Properties east of Cumberland are generally B-zoned up to McKercher, except for a few instances. The rest of the street, as it extends west to the river, includes spots of B zoning but for the most part is made up of M zoning. The main purpose of M zoning is to provide uses for professional office users, service providers, and other non-retail type businesses. Most of the targeted occupants allowed in M zoning have a lower impact on traffic and parking, for example. Because 8th St is backed by homes, a few of the side streets have residential properties coming right up to main causeway. This week I was made aware that a property on the corner of Munroe and 8th was seeking a rezone from R2 (single family and low density multi- family residential) to M2. The other properties to the east and west of this building, as it sits on the corner of 8th St, are already M zoned. In my opinion, there isn’t much cause to oppose the use as it aligns with the rest of the block. Where it can be trickier, however, is when a spot rezone is established using a zoning by agreement with the City. We’d typically see this in neighbourhoods that already have existing imbalance or perceived impact issues from commercial properties near residential lots. As the City has evolved, commercial tenancies have crept up on residential neighbourhoods. City Park is a good example, where the hospital has caused similar service providers to convert homes or properties into office immediately adjacent on Queen Street. Neighbouring side streets feel the brunt of this heightened activity, often losing street parking in front of their homes to people visiting the hospital or these businesses. It can be a huge issue as virtually none of these homeowners have a front driveway to offset the street parking. Public consultation in this type of situation can be tenuous. 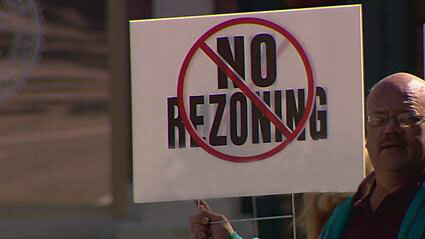 The City will have a hard time agreeing to the rezone if the reaction of existing property owners is too strong. In these situations, the City will often pre-emptively come up with a zoning by agreement which takes the proposed zoning and further tightens the development constraints or uses on it. An example of zoning by agreement would be the Tamara’s House which existed on Victoria Ave in Nutana. Tamara’s House, founded in the early 90s, was an eight-bed residence facility which provided programming for victims of abuse and their families. While we can all agree shelters are necessary in our community, most people are not overly excited to have one moving in next door to them. In this particular case, a zoning by agreement was reached with the community to set the specific use of the facility and develop it in a fashion to blend in with other properties. The facility has since closed and the property sold. The new owners knew part of their due diligence would be reaching a new agreement with the City if their use did not fall under the very specific guidelines originally set up for Tamara’s House. The important take away from this conversation is knowing what type of rezoning you’re looking at if you’re purchasing or leasing a property that has a spot rezone. When in doubt, the City is the first and last authority on site uses.